The Bonneville Power Administration will raise wholesale power rates by an average of 5.4 percent this fall, and that will mean higher electricity bills for Cowlitz PUD customers. BPA announced Wednesday that the rate hike will take effect Oct. 1, along with a 0.7 percent transmission rate decrease. The federal agency markets wholesale power from Columbia River hydroelectric dams to utilities throughout the region. Cowlitz PUD gets 90 percent of its power from Bonneville, so its costs are sensitive to changes in Bonneville's prices. The utility's contract with Bonneville doesn't expire until 2028. Cowlitz PUD will likely be forced to increase its own rates as a result, but the extent of the increase won't be clear until early September, said Steve Kern, general manager of Cowlitz PUD. Right now the utility is working through its budget to determine the effects of the added costs, Kern said. In June, Cowlitz PUD estimated that if Bonneville raised rates by 5.5 percent, that it would likely boost its power costs by $10 million. That could mean the average Cowlitz PUD customer will pay an extra $4 to $8 monthly, or about $48 to $96 annually. The average customer now pays $125 a month. "I think we'll do our best to absorb whatever cost we can," Kern said. However, there isn't much wiggle room in the PUD's annual $280 million budget because power purchases from Bonneville account for 80 to 90 percent of costs. This fiscal year, the Cowlitz PUD adopted measures that saved $2.5 million, allowing the utility to avoid raising rates for customers. Other than cutting costs, the utility has tried to boost revenue by more aggressively selling its surplus power on the spot market. Bonneville says it must raise rates to make up for lower-than-expected demand for power, declining revenue from surplus power sales and growing cost from increased regulations. "We worked very hard on behalf of our customers to manage our costs and make changes that will strengthen our finances and improve our competitive position in the rapidly changing electricity market," Elliot Mainzer, BPA Administrator and CEO, said in a press release. 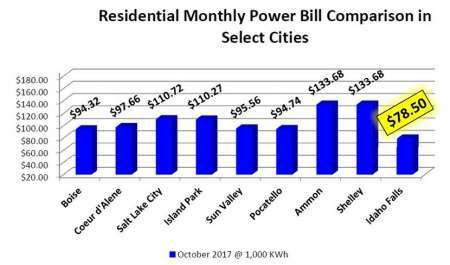 "However, ... costs beyond our direct control continue to place significant upward pressure on our power rates. BPA will further address these cost pressures through the completion of a long-term business strategy later this year in collaboration with customers and regional partners," Mainzer added. Kern said the rate hike continues to chip away at Bonneville's long-term competitiveness, adding that Cowlitz PUD will continue to examine how it can find alternative power sources when its contract with BPA expires in 2028.